Not to be confused with Constellations. For differences between systems, see Sidereal and tropical astrology and Zodiac. The concept of the zodiac originated in Babylonian astrology, and was later influenced by Hellenistic culture. According to astrology, celestial phenomena relate to human activity on the principle of "as above, so below", so that the signs are held to represent characteristic modes of expression. Modern discoveries about the true nature of celestial objects have undermined the theoretical basis for assigning meaning to astrological signs, and empirical scientific investigation has shown that predictions and recommendations based on these systems are not accurate. :85;:424 Astrology is generally regarded as pseudoscience. While Western astrology is essentially a product of Greco-Roman culture, some of its more basic concepts originated in Babylon. Isolated references to celestial "signs" in Sumerian sources are insufficient to speak of a Sumerian zodiac. Specifically, the division of the ecliptic in twelve equal sectors is a Babylonian conceptual construction. ), or apparent stationary moment (shift from retrograde to direct, or vice versa: S). Empedocles, a fifth-century BC Greek philosopher, identified Fire, Earth, Air, and Water as elements. He explained the nature of the universe as an interaction of two opposing principles called love and strife manipulating the four elements, and stated that these four elements were all equal, of the same age, that each rules its own province, and each possesses its own individual character. Different mixtures of these elements produced the different natures of things. Empedocles said that those who were born with near equal proportions of the four elements are more intelligent and have the most exact perceptions. Each sign is associated with one of the classical elements, and these can also be grouped according to polarity: Fire and Air signs are considered positive or extrovert, masculine signs; while Water and Earth signs are considered negative or introvert, feminine signs. The four astrological elements are also considered as a direct equivalent to Hippocrates' personality types (sanguine = air; choleric = fire; melancholic = earth; phlegmatic = water). A modern approach looks at elements as "the energy substance of experience" and the next table tries to summarize their description through keywords. Classification according to element has gained such importance, that some astrologers start their interpretation of a natal chart, by studying the balance of elements shown by the position of planets and angles (especially the Sun, the Moon and the Ascendant). The combination of element and modality provides a basic sign characterization. For instance, Capricorn is a cardinal earth sign, meaning that it is associated with action (cardinal modality) in the material world (earth element). That can translate into ambition or practical application to the concrete, everyday necessities of life. The next table displays the twelve combinations of elements and modalities. Rulership is the connection between planet and correlated sign and house. In traditional Western astrology, each sign is ruled by one and only one of the seven visible planets (note that in astrology, the Sun and Moon are termed The Lights, while the other bodies are called planets, which literally means wanderers, i.e. wandering stars as opposed to the fixed stars). The traditional rulerships are as follows: Aries (Mars), Taurus (Venus), Gemini (Mercury), Cancer (Moon), Leo (Sun), Virgo (Mercury), Libra (Venus), Scorpio (Pluto), Sagittarius (Jupiter), Capricorn (Saturn), Aquarius (Uranus), and Pisces (Neptune). Psychologically-oriented astrologers often believe that Saturn is the ruler or co-ruler of Aquarius instead of Uranus; Neptune is the ruler or co-ruler of Pisces instead of Jupiter, and that Pluto is the ruler or co-ruler of Scorpio instead of Mars. Some astrologers believe that the planetoid Chiron may be the ruler of Virgo, while other group of modern astrologers claim that Ceres is the ruler of Taurus instead. Other astrologers, still, use the former planets Pallas, Vesta, Juno and Hygiea in their delineations and rulerships, for example Vesta to Taurus and Pallas to Virgo. Debate continues between those who consider the newly discovered planets as rulers or co-rulers of certain signs and those that do not. Some astrologers do not even use the astrological signs at all (mostly Cosmobiologists and Uranian Astrologers/Hamburg School). Therefore, they do not take into account planetary rulerships and the essential dignities when interpreting an astrological chart. Note that, if one starts from Leo and Cancer, the traditional planetary rulers are arrayed outward in the same order from the sun as they occur in the natural solar system. The Lights ruling Leo and Cancer, Mercury ruling Virgo and Gemini, Venus ruling Libra and Taurus, Mars ruling Scorpio and Aries, Jupiter ruling Sagittarius and Pisces, Saturn ruling Capricorn and Aquarius. The result is a symmetry of traditional rulerships across the 0° Leo/Aquarius axis. Note that modern rulerships, which attribute Pluto as ruler of Scorpio, break this symmetry. The following table shows both, traditional and modern, rulerships. To note that Fire and Air (light elements) signs are opposited between them, like happens for Earth and Water ones (heavy elements). Spring signs are opposite to autumn ones, and winter signs are related to summer ones. A traditional belief of astrology, known as essential dignity, is the idea that the Sun, Moon and planets are more powerful and effective in some signs than others, because the basic nature of both is held to be in harmony. By contrast, they are held to find some signs to be weak or difficult to operate in because their natures are thought to be in conflict. The most important of these categories are Dignity, Detriment, Exaltation and Fall. Dignity and Detriment : A planet is strengthened or dignified if it falls within the sign that it rules. In other words, it is said to exercise Rulership of the sign. For example, the Moon in Cancer is considered "strong" (well-dignified). Seventeenth century astrologer William Lilly compared rulership to a king on his throne, with considerable dignity. If a planet is in the sign opposite that which it rules (or is dignified), it is said to be weakened or in Detriment (for example, the Moon in Capricorn). In traditional astrology, other levels of Dignity are recognised in addition to Rulership. These are known as Exaltation (see below), Triplicity, Terms or bounds, and Face or Decan, which together are known as describing a planet's Essential dignity, the quality or ability to give of one's true nature. Contemporary traditional astrologers like John Frawley or J Lee Lehman explain further on the concept of Essential Dignity. Exaltation and Fall : In addition, a planet is also strengthened when it is in its sign of Exaltation. In traditional horary astrology, Exaltation denotes a level of dignity somewhat exaggerated compared to rulership. Exaltation was considered to give the planet (or what it signified in a horary chart) dignity, with the metaphor of an honoured guest – who is the centre of attention but the extent of their ability to act is limited. Examples of planets in their Exaltation are: Saturn (Libra), Sun (Aries), Venus (Pisces), Moon (Taurus), Mercury (Virgo, although some disagree to this classification), Mars (Capricorn), Jupiter (Cancer). A planet in the opposite sign of its Exaltation is said to be in its Fall, and thus weakened, perhaps seemingly more so than Detriment. The Planet in fall is passively rejected or ignored by the sign that it's in. It can be likened to a mayor of a rival city trying to make suggestions to the hosting mayor for how he should run his city: The host mayor finds it difficult to trust him and cannot see how his input could have relevancy to his city. The people of the city feel the same as their ruler. The result is impasse and failure on behalf of both mayors and the city. There is no agreement as to the signs in which the three extra-Saturnian planets may be considered to be exalted. In addition to essential dignity, the traditional astrologer considers Accidental dignity of planets. This is placement by house in the chart under examination. Accidental dignity is the planet's "ability to act." So we might have, for example, Moon in Cancer, dignified by rulership, is placed in the 12th house it would have little scope to express its good nature. 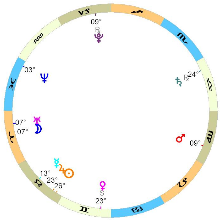 The 12th is a cadent house as are the 3rd, 6th and 9th and planets in these houses are considered weak or afflicted. On the other hand, Moon in the 1st, 4th, 7th or 10th would be more able to act as these are Angular houses. Planets in Succedent houses of the chart (2nd, 5th, 8th, 11th) are generally considered to be of medium ability to act. Besides Accidental Dignity, there are a range of Accidental Debilities, such as retrogradation, Under the Sun's Beams, Combust, and so forth. Each sign can be divided into three 10° sectors known as decans or decanates, though these have fallen into disuse. The first decanate is said to be most emphatically of its own nature and is ruled by the sign ruler. The next decanate is sub-ruled by the planet ruling the next sign in the same triplicity. The last decanate is sub-ruled by the next in order in the same triplicity. While the element and modality of a sign are together sufficient to define it, they can be grouped to indicate their symbolism. The first four signs, Aries, Taurus, Gemini and Cancer, form the group of personal signs. The next four signs, Leo, Virgo, Libra and Scorpio form the group of interpersonal signs. The last four signs of the zodiac, Sagittarius, Capricorn, Aquarius and Pisces, form the group of transpersonal signs. The winter season is when daylight is increasing and there is more darkness than daylight. The spring season is when daylight is increasing and there is more daylight than darkness. The summer season is when darkness is increasing and there is more daylight than darkness. The autumn season is when darkness is increasing and there is more darkness than daylight. In Indian astrology, there are four elements: fire, earth, air, and water. The master of fire is Mars, while Mercury is of earth, Saturn of air, and Venus of water. Jyotish astrology recognises twelve zodiac signs (Rāśi), that correspond to those in Western astrology. The relation of the signs to the elements is the same in the two systems. A nakshatra (Devanagari: नक्षत्र, Sanskrit nakshatra, from naksha- 'map', and tra- 'guard') or lunar mansion is one of the 27 divisions of the sky, identified by the prominent star(s) in them, as used in Hindu astronomy and astrology (Jyotisha). Chinese astrological signs operate on cycles of years, lunar months, and two-hour periods of the day (also known as shichen). A particular feature of the Chinese zodiac is its operation in a 60-year cycle in combination with the Five Phases of Chinese astrology (Wood, Fire, Metal, Water and Earth). Nevertheless, some researches say that there is an obvious relationship between the Chinese 12-year cycle and zodiac constellations: each year of the cycle corresponds to a certain disposal of Jupiter. For example, in the year of Snake Jupiter is in the Sign of Gemini, in the year of Horse Jupiter is in the Sign of Cancer and so on. So the Chinese 12-year calendar is a solar-lunar-jovian calendar. The following table shows the twelve signs and their attributes. Chart showing the 24 cardinal directions and the symbols of the sign associated with them. 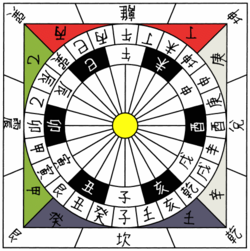 In Chinese astrology, the zodiac of twelve animal sign represents twelve different types of personality. The zodiac traditionally begins with the sign of the Rat, and there are many stories about the Origins of the Chinese Zodiac which explain why this is so. When the twelve zodiac signs are part of the 60-year calendar in combination with the four elements, they are traditionally called the twelve Earthly Branches. The Chinese zodiac follows the lunisolar Chinese calendar and thus the "changeover" days in a month (when one sign changes to another sign) vary each year. 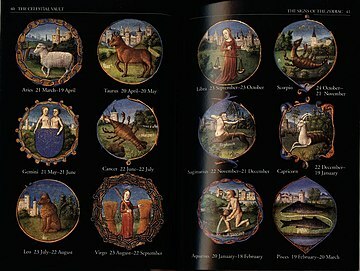 The following are the twelve zodiac signs in order. 子 Rat (Yang, 1st Trine, Fixed Element Water): Rat years include 1900, 1912, 1924, 1936, 1948, 1960, 1972, 1984, 1996, 2008, 2020, 2032. The Rat also corresponds to a particular month in the year. The hours of the Rat are 11pm – 1am. 丑 Ox (Yin, 2nd Trine, Fixed Element Earth: Ox years include 1901, 1913, 1925, 1937, 1949, 1961, 1973, 1985, 1997, 2009, 2021, 2033. The Ox also corresponds to a particular month in the year. The hours of the Ox are 1am – 3am. 寅 Tiger (Yang, 3rd Trine, Fixed Element Wood): Tiger years include 1902, 1914, 1926, 1938, 1950, 1962, 1974, 1986, 1998, 2010, 2022, 2034. The Tiger also corresponds to a particular month in the year. The hours of the Tiger are 3am – 5am. 卯 Rabbit (Yin, 4th Trine, Fixed Element Wood): Rabbit Years include 1903, 1915, 1927, 1939, 1951, 1963, 1975, 1987, 1999, 2011, 2023, 2035. The Rabbit also corresponds to a particular month in the year. The hours of the Rabbit are 5am – 7am. 辰 Dragon (Yang, 1st Trine, Fixed Element Earth): Dragon years include 1904, 1916, 1928, 1940, 1952, 1964, 1976, 1988, 2000, 2012, 2024, 2036. The Dragon also corresponds to a particular month in the year. The hours of the Dragon are 7am – 9am. 巳 Snake (Yin, 2nd Trine, Fixed Element Fire): Snake years include 1905, 1917, 1929, 1941, 1953, 1965, 1977, 1989, 2001, 2013, 2025, 2037. The Snake also corresponds to a particular month in the year. The hours of the Snake are 9am – 11am. 午 Horse (Yang, 3rd Trine, Fixed Element Fire): Horse years include 1906, 1918, 1930, 1942, 1954, 1966, 1978, 1990, 2002, 2014, 2026, 2038. The Horse also corresponds to a particular month in the year. The hours of the Horse are 11am – 1pm. 未 Goat (Yin, 4th Trine, Fixed Element Earth): Goat years include 1907, 1919, 1931, 1943, 1955, 1967, 1979, 1991, 2003, 2015, 2027, 2039. The Goat also corresponds to a particular month in the year. The hours of the Goat are 1pm – 3pm. 申 Monkey (Yang, 1st Trine, Fixed Element Metal): Monkey years include 1908, 1920, 1932, 1944, 1956, 1968, 1980, 1992, 2004, 2016, 2028, 2040. The Monkey also corresponds to a particular month in the year. The hours of the Monkey are 3pm – 5pm. 酉 Rooster (Yin, 2nd Trine, Fixed Element Metal): Rooster years include 1909, 1921, 1933, 1945, 1957, 1969, 1981, 1993, 2005, 2017, 2029, 2041. The Rooster also corresponds to a particular month in the year. The hours of the Rooster are 5pm – 7pm. 戌 Dog (Yang, 3rd Trine, Fixed Element Earth): Dog years include 1910, 1922, 1934, 1946, 1958, 1970, 1982, 1994, 2006, 2018, 2030, 2042. The Dog also corresponds to a particular month in the year. The hours of the Dog are 7pm – 9pm. 亥 Pig (Yin, 4th Trine, Fixed Element Water): Pig years include 1911, 1923, 1935, 1947, 1959, 1971, 1983, 1995, 2007, 2019, 2031, 2043. The Pig also corresponds to a particular month in the year. The hours of the Pig are 9pm – 11pm. Wood: The wood person has high morals, is self-confident, expansive and co-operative, with wide and varied interests and idealistic goals. The direction associated with Wood is East, and the season is spring, which makes it the fixed element for the animal signs Tiger and Rabbit. Fire: The fire person has leadership qualities, dynamic passion, and is decisive, self-confident, positive and assertive. The direction associated with Fire is South, and the season is summer, which makes it the fixed element for the animal signs Snake and Horse. Earth: The earth person is serious, logical and methodical, intelligent, objective and good at planning. The direction associated with Earth is Center. The season for Earth is the changeover point of the four seasons. It is the fixed element for the animal signs Ox, Dragon, Goat and Dog. Metal: The metal person is sincere, has fixed values and opinions, is strong of will, and has eloquence of speech. The direction associated with Metal is West. The season for Metal is Autumn. It is the fixed element for the animal signs Monkey and Rooster. Water: The water person is persuasive, intuitive, and empathetic. The water person is objective and often sought out for their counsel. The direction associated with water is North. The season for Water is Winter. It is the fixed element for the animal signs Rat and Pig. The five elements operate together with the twelve animal signs in a 60-year calendar. The five elements appear in the calendar in both their yin and yang forms and are known as the ten Celestial stems. When trying to calculate the relevant year of the cycle in relation to the Gregorian calendar, an easy rule to follow is that years that end in an even number are Yang (representing masculine, active and light), those that end with an odd number are Yin (representing feminine, passive and darkness). ^ Mayo (1979), p. 35. ^ Zarka, Philippe (2011). "Astronomy and astrology". Proceedings of the International Astronomical Union. 5 (S260): 420–425. doi:10.1017/S1743921311002602. ^ Bobrick (2005), pp. 10, 23. ^ Rochberg (1998), p. ix. ^ Sachs (1948), p. 289. ^ Charlie Higgins (1997). "Astrology and The Four Elements". Archived from the original on 2010-01-03. Retrieved 2009-12-27. ^ Arroyo (1989), p. 27. ^ Glyphs from the alchemical symbology. ^ Arroyo (1975). pp. 131–140. ^ Arroyo (1989), p. 29. ^ a b Carol Wills (2007). "Rulerships". astrologynow.com. Archived from the original on 2007-01-27. Retrieved 2007-11-29. ^ Shamos, Geoffery (2013). "Astrology as a Social Framework: The 'Children of Planets', 1400–1600". Journal for the Study of Religion, Nature & Culture. 7 (4): 434–460. doi:10.1558/jsrnc.v7i4.434. ^ "Chiron as True Ruler of Virgo?". Retrieved July 18, 2014. ^ Hone (1978), p. 21. ^ "Opposition". dichesegnosei.it (in Italian). ^ "The element of Air". dichesegnosei.it (in Italian). ^ "The element of Fire". dichesegnosei.it (in Italian). ^ "The element of Water". dichesegnosei.it (in Italian). ^ "The element of Earth". dichesegnosei.it (in Italian). ^ "Accidental Dignity". www.gotohoroscope.com. Astrological Dictionary 1998–2007. 26 November 2007. ^ Armstrong, Robin (2009). "The Signs and the Houses". RASA School of Astrology. ^ Armstrong, Robin (2009). "I Ching: The Sequence of Change". RA Publications. ^ Sutton (1999) pp. 74–92. ^ Sutton (1999), p. 168. 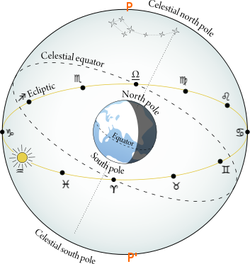 ^ "'Almanac' 'lunar' zodiac beginning of spring as the boundary dislocation? – China Network". 16 February 2009. Retrieved 5 January 2011. ^ Novak, Sarah. "The Chinese Zodiac". Faces. 34: 42. Bobrick, Benson (2005). The Fated Sky: Astrology in History. Simon&Schuster. 369 pp. Caiozzo, Anna (2003). Images of the Sky. Paris-Sorbonne. Signs and Constellations. Eric Francis (2016). "Why Your Zodiac Sign is Not Wrong"
Johnsen, Linda (2004 March). A Thousand Suns: Designing Your Future with Vedic Astrology. Yes International Publishers. Rochberg, Francesca (1998), "Babylonian Horoscopes", American Philosophical Society, New Series, Vol. 88, No. 1, pp. i–164. doi:10.2307/1006632. JSTOR 1006632. Rudhyar, Dane (1943). Astrological Signs – The Pulse of Life. Sachs, Abraham (1948), "A Classification of the Babylonian Astronomical Tablets of the Seleucid Period", Journal of Cuneiform Studies, Vol. 2, No. 4, pp. 271–290. doi:10.2307/3515929. JSTOR 3515929. Sutton, Komilla (1999). The Essentials of Vedic Astrology. England: The Wessex Astrologer Ltd.